A recent post on the rapidly increasing length of Wisconsin Supreme Court decisions—whose average page count has doubled since the mid-1990s—ended with a hypothesis to be tested following the 2014-15 term. More specifically, in light of the new rules adopted by the court to reduce the amount of time between oral argument and decision filing, it seemed plausible to wonder if hastening the filing of decisions might also trim their length. For a time, though, it remained unclear whether the new rules would achieve even the goal of shortening the time to filing, let alone correlate with changes in other areas, notably the average length of decisions. But now that complete information for 2014-15 is available, both questions can be answered—at least until the next term hits its stride. As noted in “Some Initial Observations,” the court did indeed cut significantly the time taken to file decisions compared to its average for recent terms. But—to focus on the central question here—this reduction of time was not accompanied by a reduction of bulk. 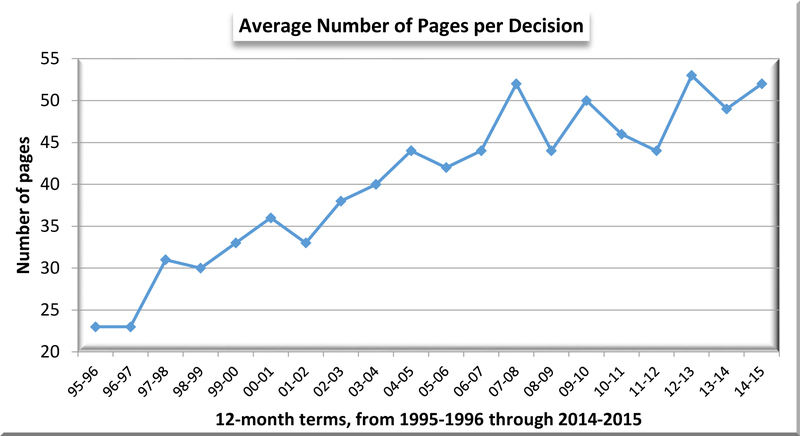 As illustrated in the graph, the average number of pages per decision climbed from 49 in 2013-14 to 52 in 2014-15, one page short of its high point for the graph’s twenty-year interval—and quite possibly the court’s entire history. Given the apparent objective of the new rules to discourage concurrences and dissents, it should occasion no surprise that separate opinions in 2014-15 did not average any more pages per decision than they did in the previous term (Table 1). In fact, one might have expected the average to drop in 2014-15, because the number of separate opinions fell from 82 in 2013-14 to 60 in 2014-15. As it happened, the average would have plunged were it not for the mammoth John Doe decision issued in July of 2015. This decision included 300 pages of separate opinions, and without it the average of 17 pages of concurrences and dissents per decision in 2014-15 would have fallen to 12 pages. In contrast, the average length of a majority opinion in 2014-15 would have declined only from 33 to 31 pages, had the John Doe decision been omitted from the calculations. As in years past, the average length of majority opinions differed a good deal among individual justices (Table 2), with the largest gap apparent between Justices Bradley and Roggensack on the one hand (25 and 26 pages, respectively) and Justices Ziegler and Gableman on the other (38 and 41 pages). Consistent with the longer majority opinions issued by the court as a whole in 2014-15, five of the seven justices posted higher average page counts than in the previous term. So far, then, the court’s new rules to hasten the filing of decisions have succeeded on that score, but without—as yet—producing discernible movement on certain other fronts where one might have expected to detect concurrent influence. For instance, instead of the court’s brisker pace increasing the number of decisions filed—a plausible result—the total fell (Table 1), and the average length increased. Fewer and longer decisions are certainly compatible outcomes and may represent the new normal compared to the court’s output in the 1990s. Still, it would be interesting to know if the justices view either, or both, of these outcomes as desirable. Perhaps a year from now, with the results of the 2015-16 term in hand, we will discover some clues. Calculations for 2014-15 did not include (1) decisions arising from disciplinary proceedings against lawyers; (2) orders pertaining to motions for reconsideration and rulings by the Board of Bar Examiners; and (3) a per curiam decision (Sohn Manufacturing Inc. v. Labor and Industry Review Commission).